The two major varieties of olive trees planted in the Hillcrest grove at Merton in North Central Victoria are the traditional Tuscan cultivars, Frantoio and Leccino. These trees produce fruit of medium oil content and outstanding character. Our trees have been selected because of their olive oil quality rather than oil quantity. The oil derived from the olive varieties in our grove is carefully blended to produce aromatic and medium intensity extra virgin oil. In recent years the Hillcrest blend has received excellent reviews and awards. It is regarded as premium extra virgin olive oil. Well! It doesn’t take long for your friends and family to lose interest in picking olives by hand. The technique involves the use of small hand rakes or electric rakes to remove the olives and collect them in a portable catcher. 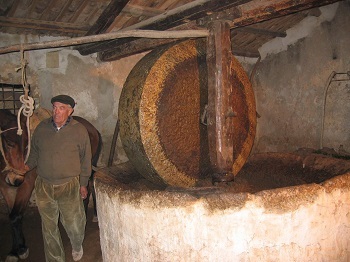 The catcher prevents the olives from falling on the ground and getting contaminated. The answer is to use a mechanical shaker which clamps to the tree trunk and vibrates the whole tree so that about 90% of the olives are removed. Have a look at this video to see the result. It is important to crush the fruit within 24 hours of picking so that the oil is truly extra virgin. Damage to the fruit or extended storage after picking will cause the extracted oil to be of poor quality. Ater the fruit arrives at the processing plant, the leaves are removed and the fruit is washed. 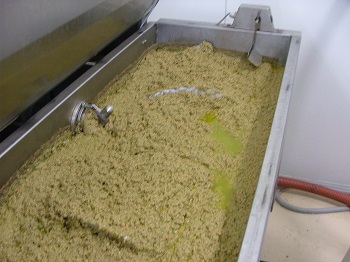 The olives are then crushed to form a pulp which is slowly mixed to assist separation. It is then centrifuged to finalize oil extraction. The final product is filtered to remove any fine vegetable particles. Modern machines make it easier than it was in days of old. To comply with the International Olive Council requirements, extra virgin olive oil must have a free fatty acid content of less than 0.80 percent weight. The 2015 harvest at Hillcrest had a free fatty acid content of 0.10 percent. There are several factors that increase the percentage of free fatty acids, including ripeness of fruit, harvesting methods, storage of fruit and processing. Each season, independent laboratory tests are carried out to analyse our extra virgin oil. The latest lab analysis and details for the technically minded can be seen by clicking this link. As members of the Goulburn Strathbogie Olive Growers Association, we participate in, and encourage our colleagues to enjoy the educational activities provided by the Association. A free exchange of ideas and experiences leads to production of superior quality extra virgin olive oils that will be appreciated by our discerning customers. International Standards for olive oil require extra virgin oil to have a free fatty acid content of no more than 0.8%. The extra virgin olive oil produced at Hillcrest Estate is consistently between 0.1% and 0.2%. Free Fatty Acids is a measure of the degree of damage or decomposition that has occurred in the fruit before pressing. Edible oils consist of small bundles of fatty acids. Each bundle has three fatty acids attached to a molecule of glycerol. When fruit is damaged or old, enzymes in the fruit act on these oil bundles and break the acids off one at a time. Once they are broken off they are referred to as free fatty acids. They are caused by oil being separated from enzymes in the fruit cell walls. These enzymes are called lipase enzymes. As the fruit ages and the cell walls break down, or the fruit is bruised during harvesting, the bundles of oil will start to decompose, releasing free fatty acids. Careful handling of the fruit during harvesting, picking the fruit before it over ripens and processing the fruit within 24 hours of harvest will limit the time the enzymes have to damage the fruit. Once the oil has been separated from the water and solids it will stabilise and free fatty acids will no longer increase. Mono–unsaturated oleic acid is known to have health benefits. 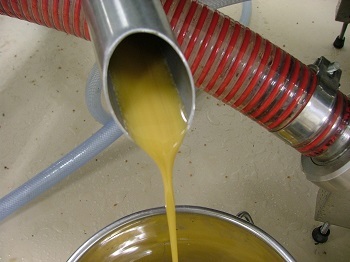 Cool climate olive oil, such as that produced at Hillcrest, has oleic acid levels near the upper limit as defined by the International Olive Council. Peroxide Value is an indicator of shelf life, low values suggesting longer life. The IOC requires that PV be less than 20 mEq O2/kg oil. Hillcrest extra virgin olive oil has a PV typically 6.0.